Wow! It's been quite a long time since I've posted something on my site. I'm sorry for the wait everyone, I was away on month long holidays overseas and too busy studying to blog. Anyway, just recently I started thinking, "I only have two promotional posters for my novel. Why not make another one?" So I did, and this is what I've come up with to help appease more readers and get them to be more aware of my novel. 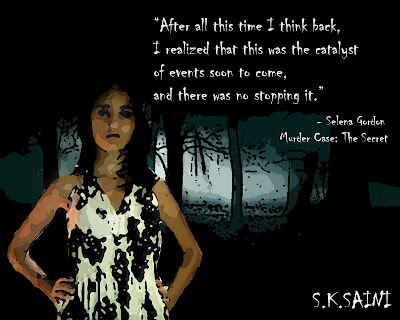 Obviously if you wonderful readers have been reading my novel chapters of Murder Case: The Secret, you'll know that the main character of the novel is Selena Gordon. I'm sure you've seen my other two book promotional posters, if you haven't I shall put them on here again. This is what Selena looks like, exactly as I invisioned her. The quotations are from the book itself and it tells us a forshadowing of bad things to come. For those who have NO idea what my novel is about, I shall explain gladly. 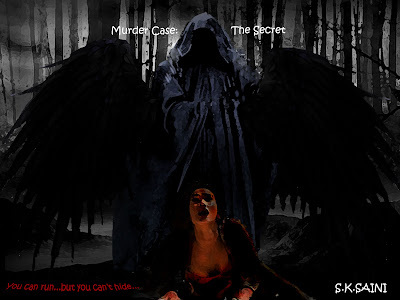 Murder Case: The Secret is about a girl who is accidently caught between the supernatural world which entered her reality. She witnesses a murder on her way home from a party with her two best friends, but the killer isn't human. It's a monster, something which she's never seen before, only in horror movies. Her friends force her to keep it a secret, as they don't want to be involved in the murder case with the police. After another classmate dies, Selena goes on a journey that will change her universe forever. She goes on a hunt to find that thing, know what it is...find that thing before it kills again, or her. 1. On the top right-hand side, you'll see a dark image which is nearly blended into the background. That is the monster upside down, part of it's wing is covering Selena's face. I will explain that symbolism in a moment. 2. The second is the gravestone. I purposely made the writing white, so you could see it properly. The gravestone is of Harley Groves, who is the character at the start of the novel which was the catalyst of the events which prompted Selena on her supernatural journey. 3. The third is the pentagram symbol, which is located right under the gravestone. This book as the symbol clearly states is about Witchcraft. How is it related? Read my novel chapters and you'll get the gist of it. 4. The fourth is the man in the trees. 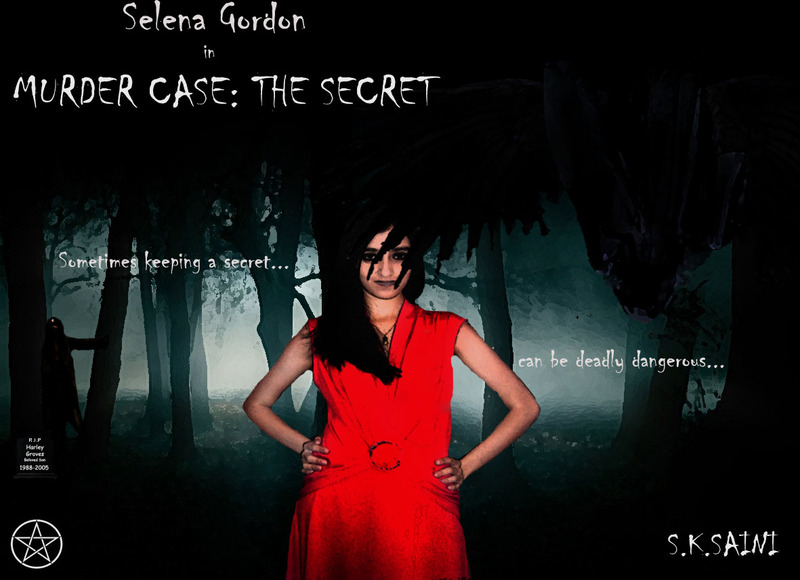 He becomes a pretty important character in the novel, and is sort of a guide and protector for Selena. 5. And the fifth and last one is Selena's face. Why is the wing of the monster covering her face, you wonder? It's to shield her identity. She doesn't want the monster to know who she is, she doesn't want it to find her. That's why her face is also blurry. She doesn't want to be seen by 'it', not does she want to be found. Well there you have it, folks! My three promotional book posters for my novel, Murder Case: The Secret. I will be making more of course, and will definitely let you guys know when I've finished it. I'm sorry I took so long updating my blog, but believe me, that is not going to happen again. For you new readers, please go to the tabs and check out my 4 offical novel chapters which I've put up on my site. I promise you, you'll love it. Also if you would be okay with it, leave comments and tell me what you think. I always love to hear from readers! Happy writings everyone, and see you soon!